Mid 1800's French craftsmanship at it's best. 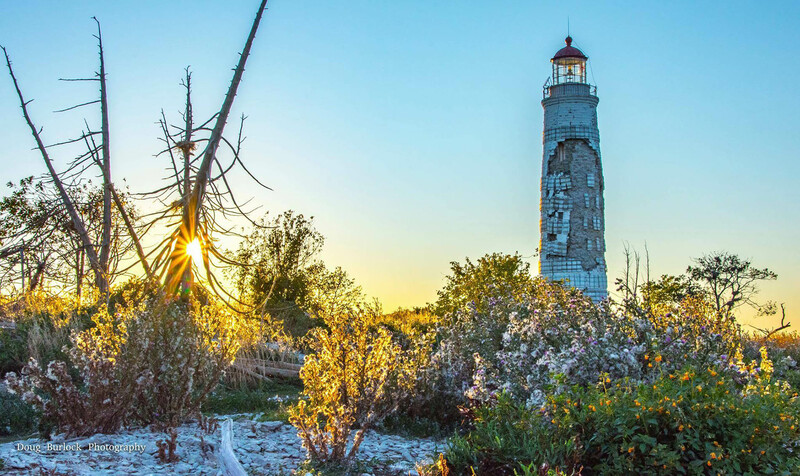 One of six "Imperial Towers" built on the Great Lakes, the Nottawasaga Lighthouse has been an iconic local landmark for over 150 years. 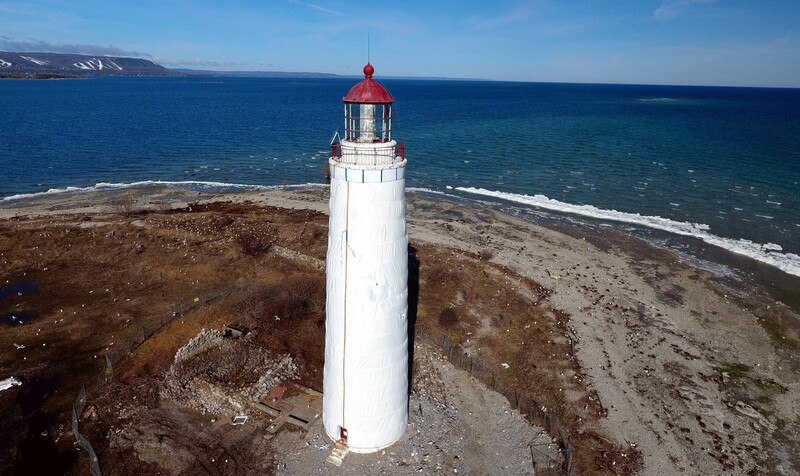 With its impressive masonry construction and intricate finishing details of European origin, the Nottawasaga Lighthouse has provided safe passage for both commercial ships and recreational boaters around the treacherous shoals and shallow waters that guard the entrance to Collingwood's harbour. Having saved countless lives through its 159 year history, the life of the Nottawasaga Lighthouse is now endangered itself and needs saving. 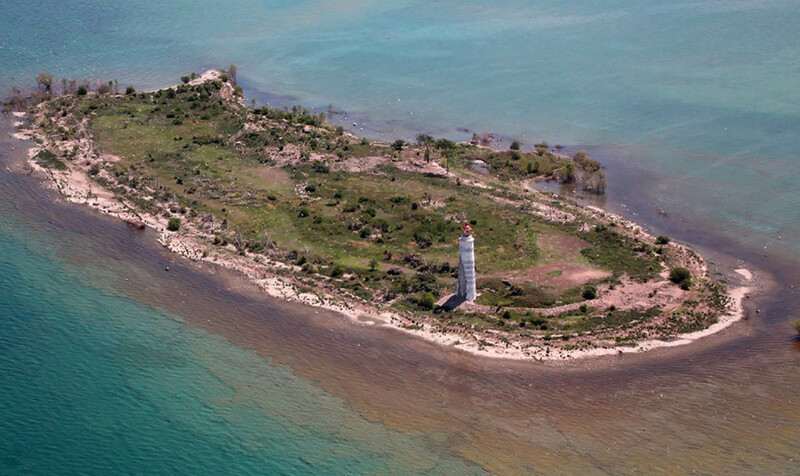 Lighthouses such as this have played an integral role in Canada's maritime history and in particular, Collingwood's Shipbuilding past. 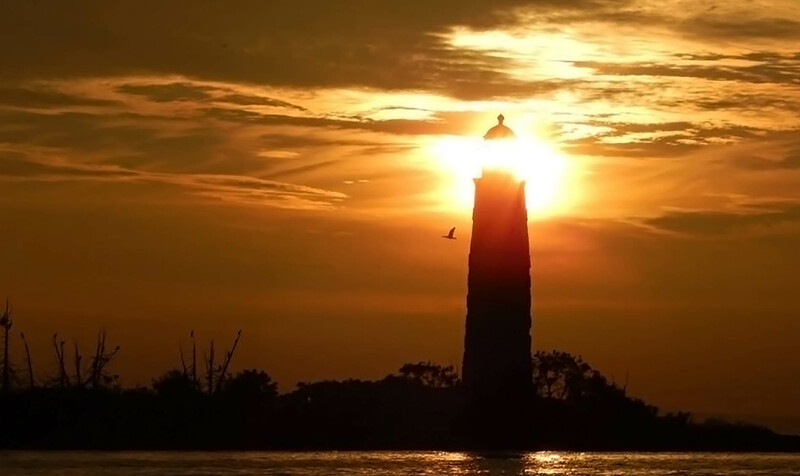 Although no longer a "lighted" navigational aid, the mere physical presence of this towering structure serves to assist recreational boaters in visually navigating their way safety back to the safe harbour in Collingwood both in good weather and in bad. 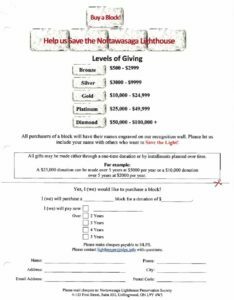 The Nottawasaga Lighthouse Preservation Society (NLPS) is a registered charity dedicated to the restoration and protection of the Nottawasaga Island Lighthouse. Preserving its history for present and future generations of Canadians to enjoy while ensuring its role as a navigational landmark continues. 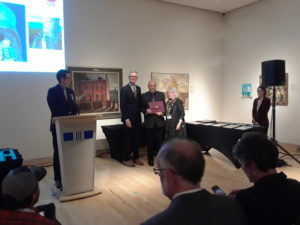 We need your help to preserve this unique part of Canada's Great Lakes history. Joining the NLPS as a MEMBER is FREE, make a DONATION or VOLUNTEER to help in whatever capacity you feel comfortable with. To learn more about the past history and current status of this unique piece of Canada's maritime heritage, please visit the HISTORY page of this website or CONTACT US for further information as to how you can help us in our Mission to save this unique and iconic structure. Limited Edition Print by Andrew Peycha. John & Carol Sanders commissioned Andrew Peycha many years ago and he agreed to have his work copied. 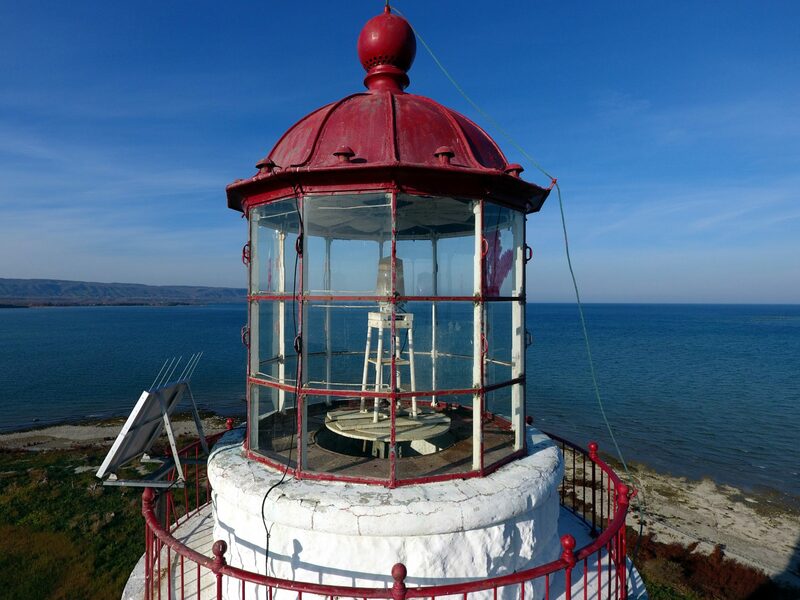 We are very grateful to him for supporting the restoration of the lighthouse. For those that are unaware, Eleanor Burke spearheaded a Bottle & Can Drive within Lighthouse Point residences. Eleanor personally collects & has returned well over $7, 000 in empties in the back of her car alone this past year! THANK YOU ELEANOR & Residents of Lighthouse Point. 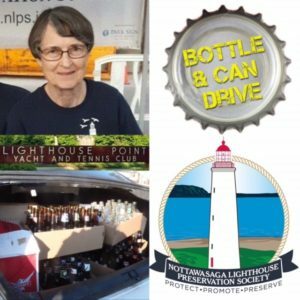 Eleanor is still collecting at Lighthouse but has also arranged to have a Bottle & Can Drive donation jar permanently at the Collingwood Beer Store for those who wish to leave their returns money for NLPS. Both Ray and Wynn are long standing NLPS members. 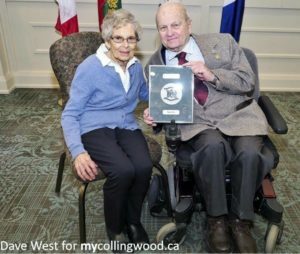 Ray brought to life a vision for a Collingwood Youth Centre and volunteered many hours designing the Youth Centre, Hospice Georgian Triangle and the Barbara Weider House. Ray allowed the NLPS the use of his property for our annual Community BBQ, three years in a row. He and Wynn are always so helpful having their property looking its best. We descend on them the day before for set up and are offered the use of their kitchen facilities for food prep. They are great hosts and welcome the public warmly to the BBQ. They also offered their property for a Paddlethon and assisted in running a yard sale all in support of the NLPS. Thank you Ray & Wynn! 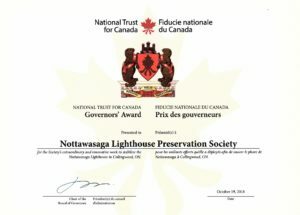 The Nottawasaga Lighthouse Preservation Society (NLPS) is pleased to announce that we have received national recognition for our restoration efforts. People who follow our progress are amazed at what we have accomplished. It is an honour to receive this award. 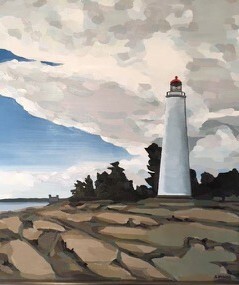 Looking for Artwork of our beautiful Nottawasaga Lighthouse? Talented Shirra Harris has a piece for you. 72”x 40” Oil on wood with a white washed maple frame $2400.00. Free shipping to Toronto, Barrie, Collingwood and surrounding areas. 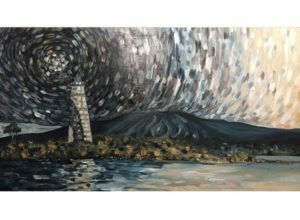 Half of the sale goes directly to help restore the Lighthouse through the NLPS.